Saia dos caminhos comuns para explorar o lado selvagem de Molokini nesta aventura de 5 horas saindo de Maui. A pequena ilha com formato crescente de Molokini é uma cratera vulcânica extinta com um próspero recife de corais, lar de mais de 250 espécies de peixes e 38 espécies de corais. Suba a bordo de um catamarã de 54 pés, com convés simples e pule na água para um mergulho com snorkel no recife de corais Turtle Arches. Em seguida, cruze a parede traseira de rocha vermelha acidentada de Molokini, lar de uma grande variedade de aves marinhas. Equipamento de mergulho com snorkel, além de um café da manhã continental, almoço com bufê e bebidas estão incluídos. Esta viagem leva você para a tranquila Molokini em um catamarã com toboágua. I signed up for this tour around 4 days before the time slot and online there were none left. I called and there was one left at 6:15. The tour guides told us it was a picture perfect day. They said they hadn’t seen a day like this in months. The waters were so calm. What a great way to see 30 feet of water so clearly. My 10 and 12 year old loved it!!! The food was good, the equipment was good enough too! I have no regrets. My wife and I had a great time! We were able to see few green sea turtles, it was so awesome seeing them swimming around us. The lunch that was provided was delicious, chicken teriyaki, bean and pasta salad. Everyone on board was incredible knowledable and helpful. We had a great time listening to Erin out in the water telling us about and showing us the sea life. We were able to see humpback whales on our way back also, we rented a go pro for $40, it was worth it, we were able to get amazing video and photos. Thank you very much to all the crew! Booked this trip on Viator as they always go above and beyond. We had a great trip out to Molokini Crater with lots of info shared for all ages, fun snorkeling time and good food. Only saw one turtle, but awesome whale sightings. Well worth “sailing “ with Pacific Wildlife Foundation. We showed up for our allocated tour time, only to be told our boat had already left and we hadn't received notices of the changed time. Luckily we still had time to rebook for another day. The snorkeling itself is abit overrated. The water is very clear and there are fish to see, however unless you swim close to the rocks, this is very difficult in the rough conditions, you don't see as much. There is not alot of coral to see either and battling the current and waves was not great. We were supposed to snorkel at a second spot, turtle arches. We stopped there for 5 mins and supposedly spotted a turtle (not sure if anybody saw it) and then we went back to the first snorkel site. Lunch was good and I recommend paying the $10 to wear a wetsuit top. Sit up top if you want to hear anything from the crew, including the fish talk, couldn't hear a thing sitting inside. Overall, a little disappointing. Great staff. Boat was very clean and comfortable. I highly recommend them for a Molokini snorkel trip! Couldn't get on the boat until posed for a photo with a life saver ring (not allowed to skip it).Also the fee includes a dontation to the Pacific whale foundation, would have been good to know this up front.Lunch was pretty good as the general helpfulness of the crew.The snorkling was ok but now as good as some other Pacific islands like Fiji and Tonga. The boat was very clean. The crew were very helpful, friendly, attentive, and generally awesome. They push the environment stuff a little extra, but not where it was in your face. They are doing the right thing. Would be good if they could go a little further south for turtles (Makena landing) instead of Wailea where reef is a little more dead (bleached). My family of seven went on this tour during our stay in Maui and everyone really enjoyed it. I've only been on a handful of snorkeling tours and this is one of the best so far. It's hosted by a conservation group called the Pacific Whale Foundation and all the money paid for the tour is given back to help protect and save the reefs. Also, all of the staff on the tour are college level marine biologists or have marine studies backgrounds so during the boat rides to and from the snorkeling spots there are two they host talks and information groups. You can learn about what you are seeing while enjoying the amazing views of Maui from the decks of the boat. The tour starts early but it's worth it for the clear waters. They feed you a small breakfast banana bread, pineapple and melons, yogurt and beverages as you travel to Molokini crater. After that they take you to Turtle Arches to see the sea turtles. While there they host a guided snorkel reef tour which was informative and fun. Once you are back on board the boat a buffet lunch is served, everyone gets a plate and then there are seconds for what is left. There was definitely enough food and you can enjoy the views as you travel back to the Pacific Wale Foundation docks. They provide: reef safe sunscreen, snorkels and flippers, noodles/flotation devices, food, beverages and water. They also have buyout rash guards for 10 which are worth it for the sun protection and help floating. I found with the rash guard I didn't need the noodle and the sun protection is worth it especially if you burn easily. Definitely one of the better snorkel trips I've been on and felt nice to help protect the gorgeous reefs and fish you are enjoying. Excellent snorkelling, seen many beautiful fish, calm waters. 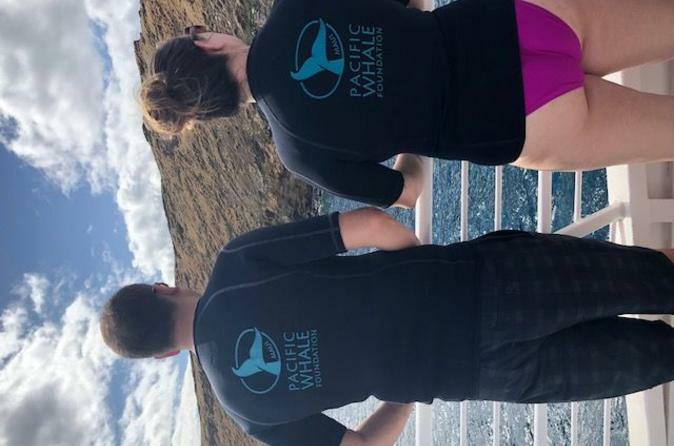 We missed out on turtle arches as it was too rough, our guides made up for it with some whale watching and a cruise around the back of Molokini. Guides are knowedglable, love that this tour benefits non-for profit. Great food and drinks.